In Pennsylvania, we stayed with Rob's mom in East Bangor, a small town in eastern Pennsylvania, just a few miles from New Jersey. It's also just a few miles from where Rob grew up in Bangor. 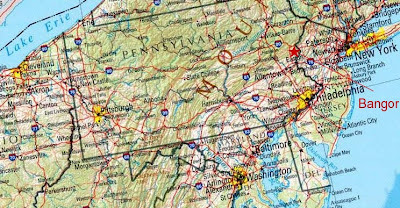 From here it takes about an hour-and-a-half to get to either New York City or Philadelphia. Bangor is a small town of just more than 5000 people, with a cute little downtown surrounded on all sides by hills and abandoned slate quarries. Bangor still retains a quaint, small-town feel, despite the huge population growth in the surrounding areas. Downtown has a total of 2 traffic lights, and there is only one other traffic light in the whole town. If you want to go to a major chain like McDonald's or K-Mart, you have to 2 towns over to Wind Gap, about 15 minutes away. This building in downtown Bangor seems like a bad place to be if the creek floods! Bangor's cute little public library dominates one of the corners of downtown. The statue on the right depicts Robert Jones, who founded Bangor in 1875 and named it after a similar slate-mining town in Wales. Back then, the slate quarries were the economic lifeblood of the area, providing raw materials for all kinds of things, including roofing shingles, sidewalks, school blackboards, and even billiard tables. Today, all of the quarries around here have been mined out, filled with water and abandoned. When Rob was in high school, teenagers used to have all kinds of fun exploring the quarries on dirt bikes and even jumping off the cliffs into the water. (Especially the cliff in the photo above) Today the police and security companies have made it almost impossible to get into the quarries without being arrested for trespassing. This Bangor playground was a gift to the town from Rob's great grandfather, Max Winkler, who was a German immigrant and very successful business man here in town. After the slate industry started dying out, the #1 local industry became textile manufacturing, and Max built the biggest and most successful of the Bangor textile mills just a few blocks from where Rob grew up. During the World War II time period, his company (Blue Ridge Winkler) was the largest supplier of upholstery fabric to the U.S. automotive industry and fabric for U.S.military uniforms. Now the mill is shut down and paved over, as are almost all of the other textile mills in the area, since it is so much cheaper to get textiles from places like China. Max wasn't the only one of Rob's family to make a big impact on Bangor. Max's son-in-law (Rob's great uncle) Bill Scott was a very popular philanthropist and mayor of Bangor from 1965 until he died in a car accident in 1972.